You know, Hatteras Island is often referred to by the locals and natives alike, as paradise. And days like yesterday, truly prove their point. And if you don’t believe me, just ask the members of HIGPS. 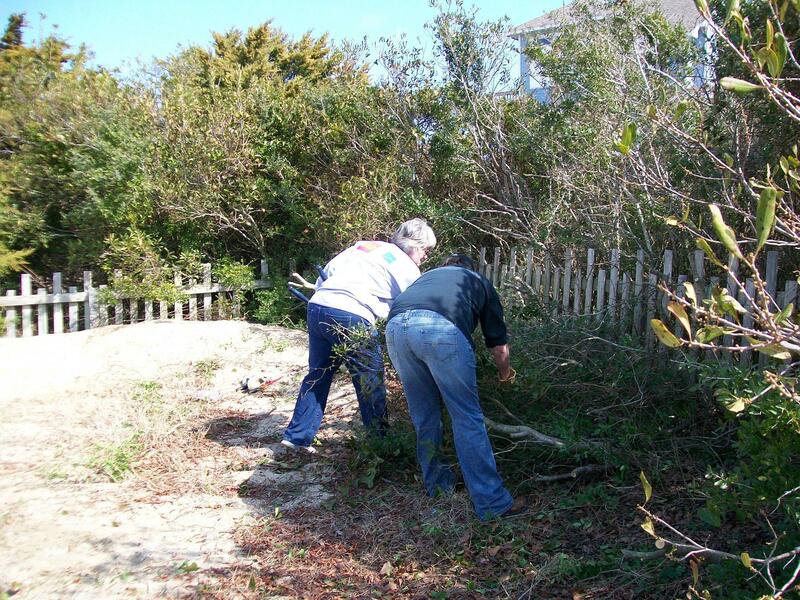 Annie Gray Clark, Angel Roller, Jody Roller, Jennifer Creech, Dorene Smeltz, and myself, spent a good part of it in Rodanthe, cleaning the brush and briers from the Meekins/Herbert Cemetery. We still have a ways to go until the entire cemetery is free of unwanted vegetation. But we were able to remove all that was growing from around the four graves and one foot stone, that were listed as being there, in the book, Sacred To Their Memory. If you don’t have a copy, you really need to buy one. It was written by Lois Johnson Meekins and Amy Midgett Gamiel. HIGPS, constantly uses it as a reference guide. I truly can’t explain how it feels to finally be able to see the grave markers of Ceil R. Meekins, Polly D. Herbert, James K. Meekins, and James W. Meekins. Several of us had been aware for quite some time that the cemetery, unknown to those just passing by, had been unkept for years. And any time we learn of a situation like that, it breaks our heart. But we can honestly now say that none of the cemetery’s residents will ever be forgotten again. At least by none of us who gave of ourselves to make sure that their final resting places are honored.